…which came in the form of Magnavox, a.k.a. the company that made the TV in your grandma’s house. The negotiations with Magnavox were long and arduous. Still, they were the only ones willing to go through with the licensing deal. Other companies like Sylvania and GE were interested and RCA even went so far as to write up the contract, but it was never signed. When an RCA employee left his job for Magnavox, he told them about the project and they agreed to take it on. Meanwhile at Carleton College in Minnesota, a student teacher named Dan Rawitsch developed a little program called Oregon Trail to help his students understand… the Trail of Tears? The Silk Road? The Ride of the Valkyries? Eh, I’m sure it’ll come to me. Rawitsch showed the game to his class on December 3rd, 1971 and it was an instant success. The game was made available on the university’s time-sharing service, making it available for all students. At the end of the spring semester Rawitsch printed out the source code and then deleted the program. You know, I’m starting to think there’s a reason most folks believe Pong was the first ever game…. With the Magnavox deal set, production of the console began in 1971. Baer unfortunately was not at all satisfied with the way Magnavox handled it. Their overcomplicated engineering resulted in a console that cost $100 ($540 in 2012 dollars) when Baer wanted it to cost $20 ($108). They also ran advertisements that showed the console being played on a Magnavox television set, leading consumers to believe it would only work on Magnavox TVs. Baer’s prospects were looking bleak in the contracting world as well, considering that the Viet Nam War was winding down and Sanders Associates was facing heavy layoffs. Baer understandably became depressed and decided right then was as good a time as any to get a back operation he had been putting off. While in the hospital he received a check from Magnavox for $100,000 and his spirits lifted instantly. The Magnavox Odyssey was first demonstrated at consumer electronics shows in April of 1972 and shipped to stores in August. The Odyssey had 27 games on 12 different cartridges but what’s very interesting is that the games were actually pre-programmed into the console itself. 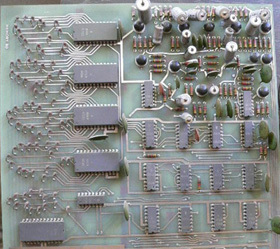 When a cartridge was inserted the jumpers inside it would create different combinations of circuits and signal generators inside the console to produce the necessary game logic. It’s really an interesting idea, but one that would make the development of any new games impossible. Still, the idea of having 27 different games in your living room was both unprecedented and astounding. There were light gun games. Particularly enterprising (read: unscrupulous) players found that the gun was indiscriminate and would register a hit if you aimed it at any source of light such as a lamp. (Remember what I said about curiosity and ingenuity before?) There were educational games like Simon Says. There were other variations on “Three shapes on the screen.” To be perfectly honest, these games were not fun; they were novel. Every medium has gone through the “novelty” phase, where the audience’s enjoyment hinged upon the piece of entertainment in question being presented in a new medium. The zoopraxiscope was a hit at the 1893 World’s Fair because the idea of a moving picture was unheard of, not because the reel was enjoyable to watch on its own merits; 90% of GIFs are more entertaining. Of course, with both film and gaming the primary limitation was technology. The Odyssey could only display between 1 and three squares on the screen, and the reason for this was technical: the Odyssey had no processor. Let that sink in for a minute. I’ll wait. 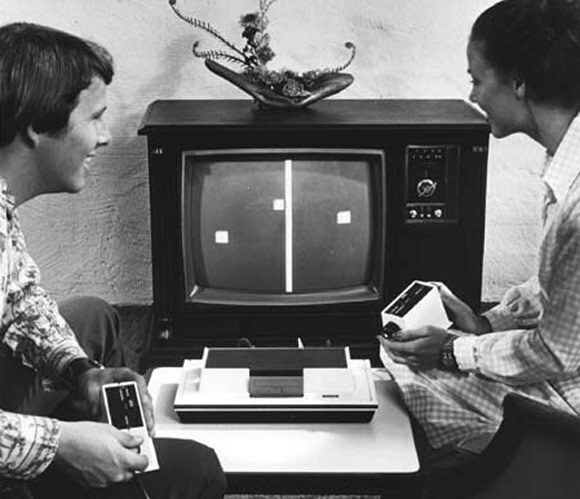 Yes, the first video game console had no processor, nor did it have color or sound. Baer did intend to introduce what he called “active cartridges” that would allow additional features like sound effects, but they were never brought to market. What the console did have was a box full of extras like dice, cards, chips, and scoreboards. This made the electronic component seem like only a part of the game; an afterthought, even. Whether this was for the better or worse I’ll let history decide (or rather, since I’m the historian here, I’ll decide “worse”). 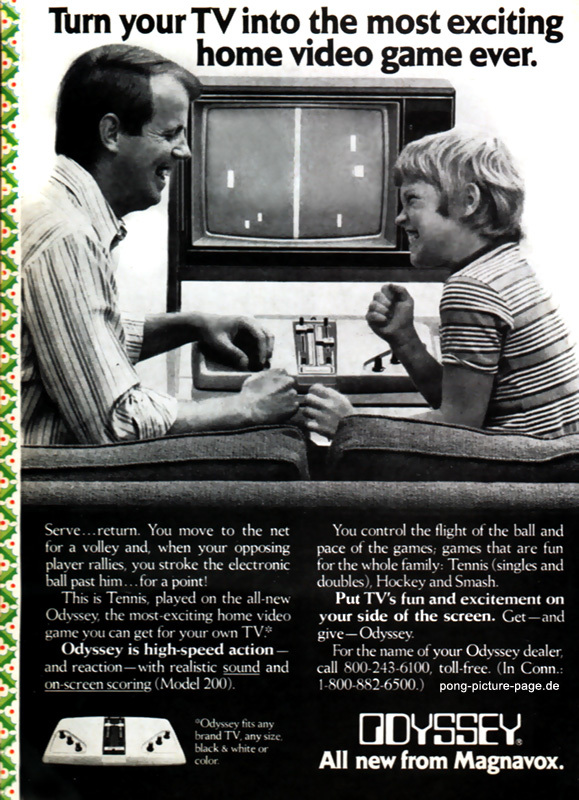 Still, the family-friendly gaming emphasis worked for the Odyssey. Baer smartly saw the market potential of families and created a market where none existed. Odyssey commercials were centered around the family decades before the Nintendo Wii would bring that sort of thing back with saccharine success. Notice how they go out of their way to point out it works with any brand TV- black & white or color. The console did not sell well at all because of Magnavox’s prior marketing, but it was well enough to keep interest in home gaming going. Meanwhile another founding father of the industry was just getting started. In the late 1960s a University of Utah student named Nolan Bushnell decided to go into gaming after playing Spacewar! It’s lucky that he was able to, considering that The U was one of only three universities in the US to have a computer with a monitor (the other two being MIT and Stanford). During college he worked at a midway on the pier where he learned how to attract players so they would give him their quarters. This will be important later. After the midway, he worked in an arcade where he learned the ins and outs of not only the machines, but also the gaming business. At college he spent a lot of time in the computer lab where he learned to program in FORTRAN and made a computer game called Fox and Geese. The rules were simple: If three or more computer-controlled geese touched the fox, he died. If the fox could nab a goose, he would eliminate it from the playfield.Bushnell graduated in 1968 and went to California. He constantly like to change venues because he was of the mind that a talented and dedicated person could reach the 90th percentile of a given discipline within three years. (to which I offer the following rebuttal: HAHAHAHA!) To that end he left Utah to work for a Northern California engineering company called Ampex. He worked for about 18 months before his restless spirit simply had to make some video games. Bushnell converted his daughter’s bedroom into a workshop and set about making a clone of Spacewar! that he named Computer Space. Bushnell and his partner Ted Dabney started designing the game from scratch. Bushnell, being an electrical engineer, found clever ways to build the prototype as cheaply as possible, including going to Goodwill and buying an old black and white TV for cheap. Bushnell needed a backer to design the game proper and happened to find one at the dentist’s office. Bushnell’s dentist told him about a patient, Dave Ralston, who worked at Nutting Associates (their motto was presumably “There ain’t Nutting you can do about it!”) and Bushnell spoke to him about funding the project. Bushnell was in luck because Nutting Associates was in financial decline and were desperate for a break. Bushnell used this as leverage to negotiate 5% royalties for every unit sold, as well as retaining intellectual rights. Bill Nutting hired Bushnell as the chief (and only) engineer. He worked long days–sometimes 16 hours–to try to have the game designed and finished in time for a trade show in October 1971. Dabney would come in after his day job to design other parts of the game, like the coin mechanism. Computer Space had no microprocessor, RAM, or even ROM! All the memory was represented with discrete diodes on the circuit board. To fulfill his artistic side as well as his engineering side, Bushnell laid out the diodes in the shapes of the ships they represented on screen. The cabinet was a futuristic, curved ordeal made from fiberglass. And boy, did it look weird–Bushnell was counting on this. During high school and college when Bushnell worked at the midway he learned how to excite potential customers and get them to spend their quarters on games. His idea now was that the cabinet would serve that purpose. You can’t dispute that a cabinet like this would turn heads! That attention was unfortunately short-lived as Bushnell and Dabney found out the hard way that the game was too difficult for average Joes to wrap their heads around, especially with push-button controls. It was hard enough to understand how to pilot a ship in a physically-realistic environment (Newtonian physics, no friction, etc.) with a joystick or knobs, but with buttons? Maybe in 1979 with Asteroids, but in 1971 when there was no precedent? Forget it. Computer Space was only popular in areas frequented by nerds Stanford engineering students. They also enjoyed another Spacewar! clone called Galaxy Game that was designed by Stanford students and set up in the student union. Galaxy Game was installed two months prior to Computer Space and was immensely popular with the engineering students, regularly hosting lines over an hour long. Galaxy Game could never hope to compete, though, as it was made with a computer that cost over $25,000 in today’s money, whereas Computer Space used cheap Transistor to Transistor Logic (TTL). Even then, the low cost of the units could not cover for their low income. Computer Space was a commercial failure. It was simply too difficult to take off. I mean, watch above how the player struggles at one point for 48 seconds to make a hit, and then dies. Nutting invested far too heavily in the game. Most coin-op arcade games at the time only sold around 2,000 units and Nutting ordered an initial run of 1,500–fewer than 1,000 were sold. What’s worse, he was so confident in the machine’s success by word-of-mouth that he fired the director of marketing, Dave “If I didn’t have the same dentist as Bushnell I’d still be employed” Ralston. There’s something hilarious about that, in a cosmic sort of way. The whole company eventually went under in 1976, but in the meantime Bushnell decided to quit while he was ahead (behind?) and left the company to go ahead with his and Dabney’s company Syzygy. The name referred to an astronomical term wherein three celestial bodies are aligned (like the Sun, Luna, and Earth during an eclipse) but the name was already in use. Bushnell instead decided to go with Atari, taken from the Japanese word あたり used in the game Go (囲碁). Bushnell and Dabney often played Go while working at Ampex and talked about founding a pizza place with arcade and midway games (more on that later). I found out later this was simply an exercise that Nolan gave me because it was the simplest game that he could think of. He didn’t think it had any play value. He believed that the next winning game was going to be something more complex than Computer Space, not something simpler. Nolan didn’t want to tell me that because it wouldn’t motivate me to try hard. He was just going to dispose of it anyway. When Alcorn began working, he tried to go off of Bushnell’s Computer Space schematics but found them to be illegible. Instead he started from scratch and managed to design a board with parts even cheaper than what Bushnell worked out. He also found a way to make the volleying of the ball back and forth more interesting. Do you remember how the Odyssey had an “English” knob for changing the direction of the puck after the paddle hit it? Well, Alcorn’s English was built into the way the paddle hit the ball, and it had the bonus of being physically accurate. The faster the paddle hit the ball, the faster it would go. The angle the paddle hit the ball determined what direction it went flying off. These rules were simple to understand, but when put into motion were quite engaging. 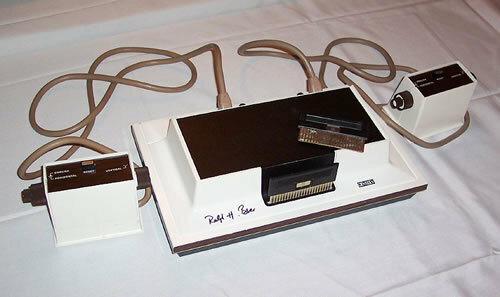 The result was a game that ought to have been called Air Hockey based on how it was played, but Bushnell went with Pong. He and Dabney were quite impressed with the game. What was meant as an exercise became a three-month project that resulted in Atari’s flagship product. Bushnell added a mysterious caption on the cabinet which read “Avoid missing ball for high score.” You have to admit, that’s a pretty interesting label. Anyone who read it would be intrigued and subsequently play a game. Atari installed their first unit in Andy Capp’s tavern, which was one of the stops along their pinball-fixing route. They didn’t make the mistake of putting it near Stanford where all the engineering students would play and love it like they did Computer Space. Bushnell wanted to see what the Average Joe thought so he put it in a shabby bar in Sunnyvale. Interestingly enough, Andy Capp’s Tavern already had a Computer Space cabinet in it. Guess which one became more popular. Pong fared well until one day Alcorn got a call from the bar’s owner, Gattis. Gattis called and told Alcorn he should come in right away to fix the machine. In the past two weeks it had developed quite a following and Gattis didn’t want the customers to be disappointed. One morning Gattis came to open the tavern and saw three customers waiting at the front door. When they went in the first thing they did was play a game of Pong. That’s how popular it was. Alcorn came in and opened the cabinet to see why it wasn’t working. When he did, quarters gushed out. Hundreds of quarters. As it turns out, the game stopped working because the breadpan holding the quarters overflowed and when players tried to shove in more, it caused an electrical short across the board. Alcorn shoved handfuls of the coins into his pockets. He handed his card to Gattis and said “Next time this happens, you call me at home right away. I can always fix this one.” Atari would not have to worry about their financial security for the time being. What they did have to worry about was the legal arm of Magnavox. Next page: Litigation and shrewd diplomacy ensure the success of Atari in a fledgling industry!